Whilst we are waiting for the great and the good of institutionalised culture in Britain to decide whether to spend £30 million to 'save' an incompetently executed painting 'for the nation' we have had time to look at the 'expert submission' (PDF) presented to the committee responsible for the decision. The export ban expired last Monday, 24 October, so they had better come up with something soon – after all, they have been pondering the subject for a year. We were initially cheered by the expert's remarks on the poor quality of the execution of the painting, but then depressed when it became clear that all these many defects were being taken to be remarkable features which contributed to the painting's value. Executed over bold free-hand underdrawing, now visible in places, it is a bravura effort, conveying character and ideals through composition, posture, and paint handling. The brushwork is fairly thin, but applied with swooping, energetic motion. The sitter is arranged for maximum effect, his arms describing a circular motion, at ease but poised. The grey of his puffy sleeves contrasts with the black of his jerkin to strike a balance between the sophisticatedly suave and the martially virile. His posture accentuates further the tapering shoulders and proportionally small head. The strong accent of red provided by the cap emphasises the alertness written across his face. All this is subtly enhanced by the low point of view. There must be some mistake: is this the same painting we have before us? Yes, it looks like it – black jerkin, small head, little red cap. Let's just dip our toe into this paragraph: the 'bold [a bit too bold if you can still see it] free-hand [no ruler or compass] underdrawing'; the 'swooping energetic motion' [taken with the above, evidence of an artist wanting to get the job done ASAP, so that he could move on to better-paid work]; 'his arms describing a circular motion' [how can they possibly do that? ]; 'a balance between the sophisticatedly suave and the martially virile' [wot? ]; 'the tapering shoulders and proportionally small head' [a good thing?]. This hyperventilating paragraph of bilge was taken over verbatim in the committee's report (PDF), clear evidence that the members of the committee and the three 'independent assessors' have no analytical skills at all – or perhaps just didn't want to apply them in this case, so much do they yearn for the delectable frisson of blowing £30 million of taxpayers' money. In a sane world such shoddy work would bring the value of the painting down to the low hundreds, perhaps even tens of pounds; in the expensive world of institutional art it gets us to £30 million. Vasari does not write that the painting was done at the time of the siege, simply that a portrait of Carlo Neroni was done by Pontormo. Unusually, Vasari makes no comment on the quality of the portrait, his few words are sufficient. 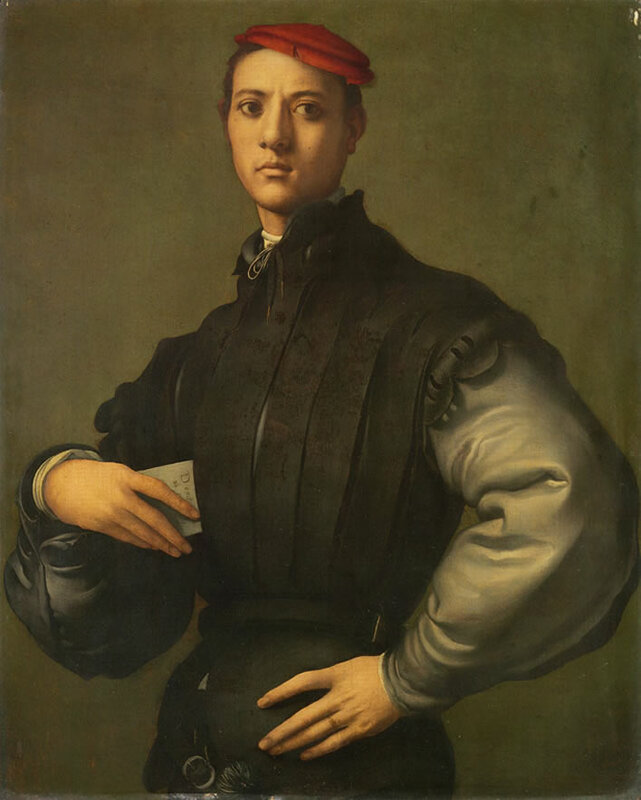 A proper historian would be uncomfortable with the circular logic of the conclusion that Pontormo did a portrait of Carlo Neroni and therefore this is a portrait of Carlo Neroni and therefore this is a portrait by Pontormo. For art historians apparently such circularity is their daily bread. Nor should we really be surprised in the logic-free zone in which we currently find ourselves at the use of 'identical to' when 'one and the same as' is really meant, or the striking oxymoron of 'virtually certain'. They considered the unusual history of this painting which had only been rediscovered, reattributed and published by Francis Russell as a Pontormo in 2008. The painting had been attributed to Alessandro Allori, when it was sold to the Earl of Caledon in 1825. However, the committee noted the words ‘Portrait frate Bronzino’ on the bookplate of probably the same Earl, which is glued to the back of the panel, so there has also been an early attribution to Bronzino. Fortunately, the man from Christie's sorted that out for them (kerching!). Never mind, onwards and upwards. Let's try and get some narrative going here. The misreading allows our expert to give us several boilerplate paragraphs about the history of the war and to come to the astonishing conclusion that the painting is a remarkable record of indomitable Florentine resistance to the aggressor. There is also much pointless fantasising over the piece of paper that the sitter is inserting or removing from his jerkin. The letter that the sitter holds in his right hand is inscribed Domi[...], likely for Domino or Domina[e], i.e. ‘to Don’ or ‘to Donna...’ He is holding it close to his breast, apparently sliding it under his jerkin, which would indicate that it is of personal nature, and thus quite possibly another reference to the marital alliance proposed first by Carol Plazzotta as the specific context for the portrait’s commission. We non-art-historian simpletons can only scratch our befuddled pates and ask ourselves: why would a painter depict someone holding / withdrawing / secreting a completely incomprehensible document displaying four characters? How does that add anything to the portrait? This painting is not only shoddy, it is incompetent. Despite the many embarrassing defects of Pontormo's 'Man in Black', the cultural fraternity believes that the painting is worth 30 million of the pounds that have been extracted from the tax-paying citizens of the United Kingdom under threat of force. One day the citizenry may rise up and sweep these cultural parasites from power. We might reasonably assume that this is the 'very beautiful' portrait of 'Francesco Guardi in the habit of a soldier' mentioned by Vasari, in which case it would also be reasonable to assume that the very similar painting of the 'Man in Black' was also by Pontormo. Both paintings display ridiculous disproportions in head, waist and hands – well, in everything, actually. Do we need to go there? The extra detail and more careful working in the 'Halberdier' portrait lead us to conclude that Guardi paid Pontormo more than Neroni did. The recycling of the pose? 'Business is business', the motto for painters down the ages. 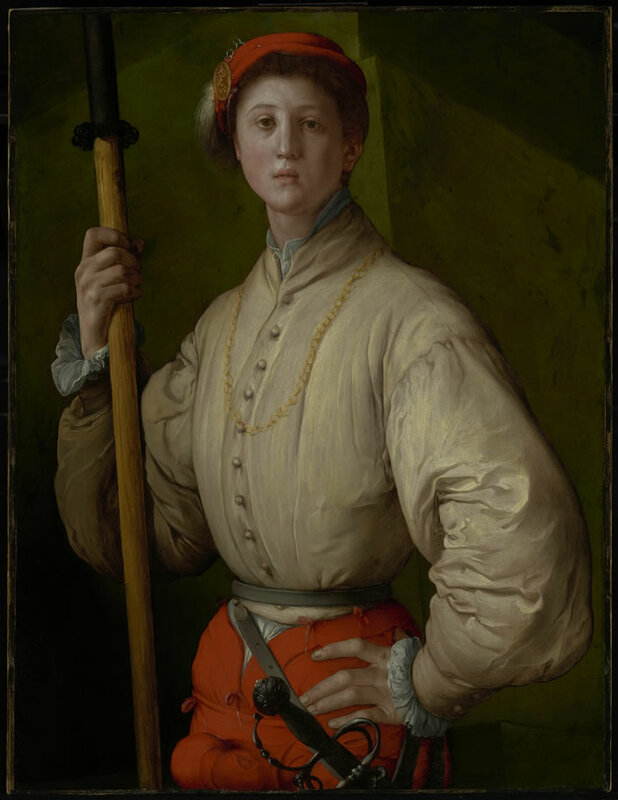 I suspect that Pontormo did the 'Halberdier' first. When he came to do the 'Man in Black' he needed to find something for the halberd-free right hand to do, hence the otherwise pointless document. Standing before a fortress wall, this well-dressed foot soldier holds a combination spear and battle-ax called a halberd. His direct stare and swaggering pose are strikingly poignant, given the smooth unlined face and slim body that betray him as no more than a teenager. As a portraitist, Jacopo Pontormo was renowned for his subtle, complex psychological studies; here he conveyed the naive arrogance and vulnerability of youth. Court painter to Duke Cosimo de' Medici, Pontormo pioneered the Mannerist style in Florence, initiating a new, sophisticated type of portraiture in which elegance and aristocratic reserve play key roles. The sitter's identity has been much discussed. The Florentine painter Giorgio Vasari noted that during the siege of Florence in about 1528 Pontormo painted a "most beautiful work," a portrait of young nobleman Francesco Guardi as a soldier. Francesco's birthdate of 1514 would make him about the age of Pontormo's teenage sitter. Based on a Florentine inventory, Cosimo de' Medici himself has also been suggested as the painting's subject. You don't think that the National Gallery wants the 'Man in Black' just to stop the Getty acquiring it to go alongside their 'Halberdier', do you? The fundraising campaign for this incompetent daubing 'raised' the 30,618,987 GBP required to buy it from its American owner, hedge fund manager with poor taste, J. Tomlison Hill. We write 'raised' in apostrophes as in 'the mugger raised fifty quid from my wallet' because 19,415,000 GBP came from the UK taxpayer and a further 4,000,000 GBP from the lottery gambler. That is, nearly three-quarters of the money came from the dis- and uninterested. In contrast, from the interested came direct donations of 2,081,436 GBP, that is, not quite seven percent. By the time the money had been 'raised' the pound had declined in value against the dollar – which was, of course, all the fault of Brexit, the artworld tells us. The currency was not yet at the level of three million Reichsmark for a packet of fags, but certainly moving in that direction. Because of this Mr Hill quite reasonably refused to accept the payment, since for him it meant a loss of about 10 million USD on the transaction. From his point of view the painting is a dollar asset whose sterling price has inflated as the pound has declined against the dollar. Being portrayed as a bozo Yankee rapacious capitalist freebooter in the UK media probably didn't help his mood, either. That refusal means the work remains his and can be treated as an asset of his, but is stuck in Britain for the next ten years. During this time the National Gallery will have to store and insure the work for him.